The ever-vigilant Grammar Patrol, Judith P. Josephson (left) and Edith H. Fine is always on the lookout for grammar goofs and gaffes. 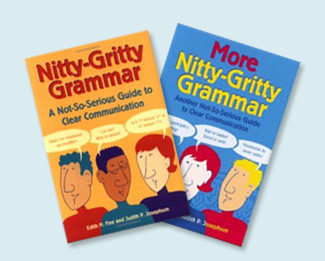 Their two popular Nitty-Gritty Grammar books include tips, humor, and more than 85 syndicated cartoons, such as Calvin and Hobbes, B.C., For Better or For Worse, Dennis the Menace, Zits, The Far Side. Whether you’re new, rusty, or doing test prep, both books offer fun, easy review. The authors have been guests on more than 100 radio shows nationwide, fielding grammar queries from listeners with panache. When not wearing their Grammar Patrol hats, Edith and Judith write children’s books, like their award-winning Armando and the Blue Tarp School from Lee & Low Books.